In the wake of the latest periodic barbaric bloodletting of palestinians by Israel that tends to occur every second year resulting in several thousand deaths of mostly women and children with many times more injured, thousands of homes and much of Gaza's infrastructure destroyed all in the name of Jewish fundamentalism for that is what best describes the Zionist ideology of Israel, one of chosen people of God that has its whole basis in myth and superstitions such as talking snakes, magic apples, women cursed to be second class citizens for eternity, and a vindictive spiteful God who punishes the WHOLE of mankind forever just for eating one apple and out this madness emerges the myth of a chosen people of God, the me, me, me, we are special syndrome, lately obsessed with finding genetic proof for a Jewish master race just as Germany of the 1930's had once been engaged in and like wise see non jews as literally sub-human Goyim to slaughter. Labour Leader Ed Milliband will clearly be fearing potential election blow back from Israel's war crimes against the Palestinian people that despite all prevading Israeli state propaganda that includes paying Israeli students $2,000 each to push the Gaza war propaganda across social media such as facebook, is just not as effective in Britain as it is in the United States as the people of Britain have long become far more skeptical of the ideologies of armageddon, the thirst for the End of the World so that the Second Coming of Jesus can take place, or Messiah or Mahdi for muslims. The IDC Herzliya “war room,” seen in a screenshot from Ynet video, is a continuation of earlier propaganda efforts. For some reason Britain is no longer as infected to anywhere near the same degree by the religion virus that has the likes of the United States in its grips, such as the 100 million or so Evangelical Christians that thirst for the second coming and have been brainwashed into thinking genocide of the Palestinian people is justified so that they can be replaced with Jewish fundamentalists of Europe as the means to bringing about Jesus's return. My best guess why this is the case with England is that which religion rules the land has been a long settled question in England i.e. the Church of England, so the debate of what is England's state religion has been settled for literally centuries. Having settled that question the British people have been able to take a far more critical look at exactly what they had been dieing and killing in the name of for centuries past which has increasingly revealed to be basically a load of B.S. So unlike the United States where there is no Church of the United States, results in aggressive extremist positions to be adopted as the differing faiths are constantly vying for superiority instead in Britain there has been a dawning of reality that religion is in totality a construct of the human mind for means of control of the general populous with promises of life after death. 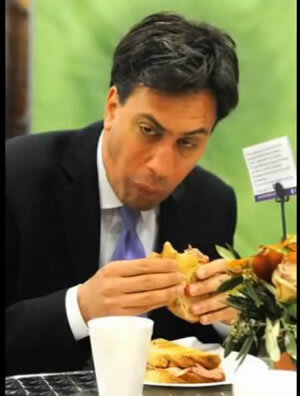 The Labour Leader Ed Milliband who is of European Jewish heritage has been eager to as simply as possible distance himself not only from the Jewish fundamentalist state of Israel but also from the myths of the Jewish faith as illustrated by the engineered eating of a Bacon sandwitch that is forbidden by Jewish law as being from an unclear animal, forbidden to be eaten, not Kosher. "As a party we oppose the further escalation of violence we have seen with Israel's invasion of Gaza,"
"I defend Israel's right to defend itself against rocket attacks. But I cannot explain, justify or defend the horrifying deaths of hundreds of Palestinians, including children and innocent civilians." Ed Milliband - 22nd July 2014. Ed Milliband again yesterday reminded people that he eats bacon sandwiches, so expect many more such statements in the run up to the general election as Ed Milliband desperately tries to distance himself from his Jewish roots, not just because of the actions of the Jewish fundamentalist state but that Jewish people are perceived as being more likely to believe in the bible old testament BS that is contrary to that of a more skeptical British electorate. Ed Milliband replied: ''I don't believe in God personally, but I have great respect for those people who do." However the bottom line is that the British electorate will be more focused on the fact that the UK economy has only just started to recover from the Last Labour catastrophic economic collapse into Mid 2009, so can Labour regardless of leader really be trusted with the economy again? Where Leaders such as Ed Milliband, David Cameron, even America's Obama are concerned, none of whom in secret actually believe in the bible BS but are usually forced to publically play along for potential bible votes, which is especially true in the US, or USrael given the evangelical virus and its consequences. 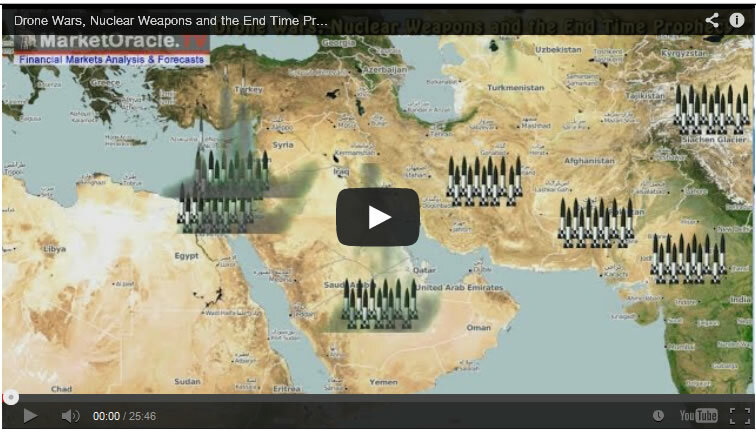 Where the middle east is concerned, a new ISIS controlled Islamic fundamentalist state is being born, the Islamic State that is following the blueprints of the Jewish fundamentalist Zionist state Israel, that ultimately means the region has a destiny with extinction as I warned of in my video of November 2013. He pretends to be Jewish in Israel and then eats bacon in Britain. He says he's an atheist but also says he wants to be Britain's first Jewish PM. He doesn't mention in his Merry Ramadan speech to Britain's Muslims that he's a Zionist, either. I wonder why? This dishonesty and trying to ingratiate himself with everyone may cost him dear. For instance, does he think Labour will be able to continue to rely on the Muslim vote if George Galloway bases Respect's election campaign on Miliband admitting to being a Zionist? 27 Jul 14, 01:48 It's the occupation, stupid. Israel is illegally occupying Palestinian land and has been since 1967. Let me put it in a more simple way: If you neighbour invades your garden and builds a shed on your lawn and moves his family in, and then builds a wall to stop you getting to what was your lawn, you are within your rights to try to resist and get your lawn back. As for Gaza, Israel kept a stranglehold on the place, preventing any real economic development. And by the way, Gazans are also Palestinians and as they see it they are fighting not only for their own freedom, but also to end the oppression of their countrymen in the occupied West Bank.